•You can enter a full or partial product name into the search box on the left column and click search. If desired you can narrow down the search to a particular category by selecting one from the drop down menu. Click “Search Options” on the left menu to bring up your search options. 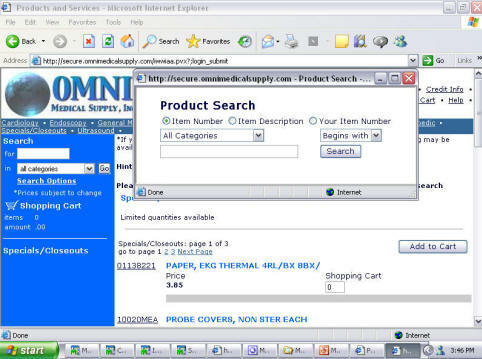 Enter your search information, whether it be a partial item number or description, to search for an item. Each product’s name can be clicked on to see a detailed description and picture if available.